For the film, see Military Academy. A military academy or service academy (in the United States) is an educational institution which prepares candidates for service in the officer corps. It normally provides education in a military environment, the exact definition depending on the country concerned. Three types of academy exist: pre-school-level institutions awarding academic qualifications, university-level institutions awarding bachelor's degree level qualification, and those preparing officer cadets for commissioning into the armed services of the state. A naval academy is either a type of military academy (in the broad sense of that term) or is distinguished from one (in the narrow sense). In U.S. usage, the United States Military Academy and the United States Naval Academy are both service academies. The Royal Danish Naval Academy was set up in 1701, making it the oldest military academy in existence. The Royal Military Academy, Woolwich was set up in 1720 as the earliest military academy in Britain. Its original purpose was to train cadets entering the Royal Artillery and Royal Engineers. In France, the École Royale du Génie at Mézières was founded in 1748, followed by a non-technical academy in 1751, the École Royale Militaire offering a general military education to the nobility. French military academies were widely copied in Prussia, Austria, Russia and even minor powers, including Turin and the Kingdom of Savoy, in the late 18th century. By the turn of the century, under the impetus of the Napoleonic Wars and the strain that the armies of Europe subsequently came under, military academies for the training of commissioned officers of the army were set up in most of the combatant nations. These military schools had two functions: to provide instruction for serving officers in the functions of the efficient staff-officer, and to school youngsters before they gained an officer's commission. 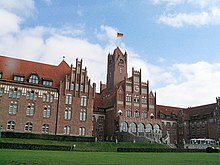 The Kriegsakademie in Prussia was founded in 1801 and the École spéciale militaire de Saint-Cyr was created by order of Napoleon Bonaparte in 1802 as a replacement for the École Royale Militaire of the Ancien Régime (the institution that Napoleon himself had graduated from). The Royal Military College, Sandhurst, in England was the brainchild of John Le Marchant in 1801, who established schools for the military instruction of officers at High Wycombe and Great Marlow, with a grant of £30,000 from Parliament. The two original departments were later combined and moved to Sandhurst. In the United States, the military academy at West Point was founded in 1802 and became popular in the 1860s. A military school teaches children (primarily boys) of various ages (elementary school, middle school or high school) in a military environment which includes training in military aspects, such as drill. Many military schools are also boarding schools, and others are simply magnet schools in a larger school system. Many are privately run institutions, though some are public and are run either by a public school system (such as the Chicago Public Schools) or by a state. Popular culture sometimes shows parents sending or threatening to send unruly children off to military school (or boarding school) to teach them good behavior (e.g., in the "Army of One" episode of The Sopranos, Tony and Carmela Soprano consider sending their son, AJ, to the Hudson Military Institute). A similar situation appears in Bill & Ted's Excellent Adventure, while other fictional depictions don't show military academies as punishment (threats) (ex. Damien: Omen II and The Presidio. A college-level military academy is an institute of higher learning of things military. It is part of a larger system of military education and training institutions. The primary educational goal at military academies is to provide a high quality education that includes significant coursework and training in the fields of military tactics and military strategy. The amount of non-military coursework varies by both the institution and the country, and the amount of practical military experience gained varies as well. Military academies may or may not grant university degrees. In the U.S., graduates have a major field of study, earning a Bachelor's degree in that subject just as at other universities. However, in British academies, the graduate does not achieve a university degree, since the whole of the one-year course (nowadays undertaken mainly but not exclusively by university graduates) is dedicated to military training. There are two types of military academies: national (government-run) and state/private-run. Graduates from national academies are typically commissioned as officers in the country's military. The new officers usually have an obligation to serve for a certain number of years. In some countries (e.g. Britain) all military officers train at the appropriate academy, whereas in others (e.g. the United States) only a percentage do and the service academies are seen as institutions which supply service-specific officers within the forces (about 15 percent of US military officers). State or private-run academy graduates have no requirement to join the military after graduation, although some schools have a high rate of graduate military service. Today, most of these schools have ventured away from their military roots and now enroll both military and civilian students. The only exception in the United States is the Virginia Military Institute which remains all-military. Cristina Fernández de Kirchner addresses the 2010 graduating class of Argentina's National Military College. 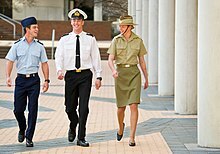 The Australian Defence Force Academy is a tri-service military college. The Academy was established in 1986. 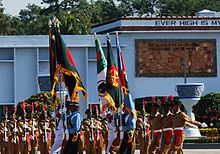 Colours Contingent of the Bangladesh Military Academy. The Academy is a training institute for officers of the Bangladesh Army. The drummers of Minsk Suvorov Military School during the 2017 Minsk Independence Day Parade. 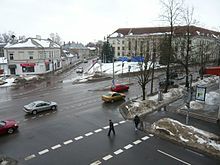 The institution is the only military high school in Belarus. The Border Services Institute's headquarters in Minsk. Cadets at Academia Militar das Agulhas Negras during a graduation ceremony. It is the largest military college operated by the Brazilian Army. Army – The biggest Academy is Academia Militar de Agulhas Negras (AMAN) in the municipality of Resende, in state of Rio de Janeiro, in the southeast of that country. For high school level, The Sistema Colégio Militar do Brasil (SCMB) is composed for 13 military schools in Belo Horizonte, Belém, Brasília, Campo Grande, Curitiba, Fortaleza, Juiz de Fora (MG), Manaus, Porto Alegre, Recife, Rio de Janeiro, Salvador and Santa Maria (RS). Navy – [Escola Naval] was founded in 1823 and is located on Villegagnon island, near downtown Rio de Janeiro. The location of the school has historical significance during the French invasions of the then Portuguese Colony in 1555. The Brazilian Navy also prepares students at the High School level at Colégio Naval in preparation for the Naval Academy (Escola Naval). Colégio Naval was founded in 1876 and is located at Enseada Almirante Batista das Neves em Angra dos Reis. Air Force – Academia da Força Aérea (AFA). (Air Force Academy) and Escola Preparatória de Cadetes do Ar(EPCAr). Royal Military College of Canada band piper and bugler. Established in 1876, the College is Canada's only post-secondary military college with degree-granting powers. Canada currently has one military-theme private boarding school open for students at the pre-university level, Robert Land Academy (RLA), which is located in West Lincoln, Ontario. Founded in 1978, it is an all-boys' institute whose funding arises solely from tuition fees. The Academy is an institute fully accredited by the province of Ontario, which accepts students from Grade 6 to Grade 12 (the Ontario Academic Credit level). Canada formerly had three university level service academies, the Canadian Military Colleges. These included the Royal Military College of Canada (RMC) in Kingston, Ontario, Royal Roads Military College (RRMC) in Victoria, British Columbia and the Collège militaire royal de Saint-Jean (CMR) in Saint-Jean-sur-Richelieu, Québec. RMC was founded in 1876, RRMC in 1941 and CMR in 1954. By the 1960s all three institutions were providing military education to officer cadets of all three elements in the Canadian Forces; the navy, army and air force; and RMC received the authority to grant academic degrees in Arts, Science and Engineering. Graduates of the Colleges are widely acknowledged to have had a disproportionate impact in the Canadian services and society, thanks to the solid foundations provided by their military education. Military discipline and training, as well as a focus on physical fitness and fluency in both of Canada's two official languages, English and French, provided cadets with ample challenges and a very fulfilling experience. In 1995 the Department of National Defence was forced to close Royal Roads Military College and Collège militaire royal de Saint-Jean due to budget considerations, but Royal Military College of Canada continues to operate. Royal Roads reopened as a civilian university in the fall of 1995, and is maintained by the Government of British Columbia. In 2007, the Department of National Defence reopened Collège militaire royal de Saint-Jean as a preparatory and first year college. 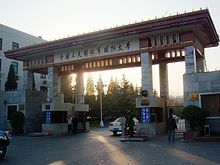 Main gate of the PLA National Defence University. The institution is a national university administered by the People's Liberation Army. The Honour Guard of José María Córdova Military School. Cadets undergo undergraduate studies at the institution. José María Córdova Military School, located in Bogotá. Marco Fidel Suarez Military Aviation School, located in Cali. Admiral Padilla Naval Academy, located in Cartagena de Indias. General Santander National Police Academy, located in Bogotá. Established in 1701, the Royal Danish Naval Academy is the oldest-still-existing officers' academy in the world. The Baltic Defence College is a multinational military college established by the three Baltic states. Students of Prytanée National Militaire having lunch, 1900. The institution is one of several military preparatory schools in France. 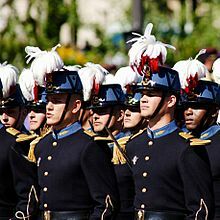 Cadets of École spéciale militaire de Saint-Cyr during the 2008 Bastille Day military parade. The military college was established in 1802 by Napoleon. École spéciale militaire de Saint-Cyr (ESM, literally the "Special Military School of St Cyr") is the French Military Academy. It is often referred to as "Saint-Cyr". Founded by Napoleon in 1802, and initially located in Fontainebleau, it was moved first to Saint-Cyr-l'École in 1808, and then to Coëtquidan (Brittany) in 1945. École Polytechnique (X): a French engineering grande école of military status. Though all of its French engineering students are enlisted and trained as officers, 5% of its graduates remain in the military after graduation. ENSTA Bretagne: a French engineering grande école of military status. Only 1/4 of its students are actual officers-in-training. École d'état-major (Staff school): first step of higher military studies, for officer of OF-2 rank. École de Guerre (War School): second step of higher military studies, mainly for ranks OF-2 and OF-3 who want to continue the command track (e.g. to command battalion or regiment). Collège d'enseignement supérieur de l'armée de terre (Army Higher Education College): second step of military education, but for officers whishing to achieve a high-level specialization. Enseignement militaire supérieur scientifique et technique (Higher Technical and Scientific Education). Centre des hautes études militaire (Center for Advanced Military Studies): final step of military education, for very few selected OF-5. Its students also attend the civilian institut des hautes études de défense nationale. National Defense Academy (NDA) of Georgia is a descendant of the first Georgian "Junker School" which was established in 1919 right after the declaration of independence. Establishment of the military school was very important for the identity of a new democratic nation-state. The school was abolished after Soviet occupation of Georgia in 1921. 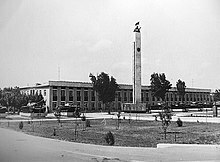 "Davit Aghmashenebeli National Defense Academy of Georgia" was founded on May 28, 1993. The length of studies at the Academy had been defined for 4 years. In 2005, due to the need of the growth of the personnel strength of the Georgian Armed Forces (GAF), the system of the Academy has been transformed to retain only the 18-month-long officer training courses. A bachelor's degree has been defined as a prerequisite for the admission of the cadets. In 2010, the NDA has undergone a new wave of the reforms to include entire officer education system. As a result, in 2011, Cadet Bachelor School, Junior Officer Basic School, Aviation and Air Defense Officer Basic School, Medical Officer School, Captain Career School, Command and General Staff School, School of Advance Defense Studies and Language Training School were included within the NDA. Upon entry into NDA, cadets sign a contract with the MoD for 10 years of military service, of which 4 years are dedicated to studies and 6 years – to consequent military service. Cadets receive the rank of Lieutenant upon graduation. NDA is established by the MoD with the status of the Legal Entity of Public Law. At the same time, NDA maintains very strong link with The Ministry of Education and Science according to the process of Bologna. The main complex of the Naval Academy Mürwik of the German Navy. Library of Bundeswehr University Munich. It provides post-secondary education to military personnel and civilians. Germany has a unique system for civil and military education. The only true military academy is the Führungsakademie der Bundeswehr where mainly future staff officers and general staff officers are further trained. The standard education in military leadership is the task of the Offizierschulen (officers' schools) run by the three branches. The contents differ from branch to branch. In the army all officers are at least trained to lead a platoon. There they also have to pass an officer exam to become commissioned later on. Moreover, there exist so called Waffenschulen (school of weapons) like infantry school or artillery school. There the officers learn to deal with the typical tasks of their respective corps. A specialty of the German concept of officer formation is the academic education. Germany runs two Universities of the German Federal Armed Forces where almost every future officer has to pass non-military studies and achieve a bachelor's or master's degree. During their studies (after at least three years of service) the candidates become commissioned Leutnant (second lieutenant). A sloop of the Hellenic Naval Academy sails past with a crew of naval cadet officers. 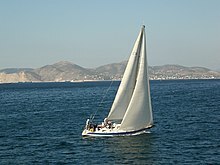 The Academy is supervised by the Hellenic Navy. The Evelpidon Military Academy, located in Athens. The Corps Officers Military Academy, located in Thessaloniki. The Icarus Air Force Academy, located in Tatoi (Athens). The Hellenic Naval Cadets Academy, located in Piraeus. Robin K. Dhowan, Chief of Naval Staff for India, reviews cadets during a passing out parade of the Indian Military Academy. The institution is a training academy of the Indian Army. Cadets of the Indonesian Military Academy in parade uniform during the Indonesian independence day ceremony. The institution is the military academy of the Indonesian Army. Cadets of the Indonesian Air Force Academy in formation before parading for the Air force anniversary ceremony. The Academy is operated by the Indonesian Air Force. The Indonesian Military Academy  was founded in Yogyakarta, October 13, 1945 by the order off the then Chief of the General Staff of the People's Security Armed Forces Lieutenant General Urip Sumohardjo as the Militaire Academie (MA) Yogyakarta. It operated until 1950, when it was closed down. Indonesian Military Academy – "AKMIL" (Akademi Militer abbreviated Akmil), located in Magelang, Central Java, is under the supervision of the Chief of Staff of the Indonesian Army, operated since 1945. Indonesian Naval Academy – "A.A.L." (Akademi Angkatan Laut abbreviated AAL), located in Surabaya, East Java, is under the supervision of the Chief of Staff of the Indonesian Navy. The Naval Academy also educates and forms officers to serve in the Indonesian Marine Corps. In existence since 1951. Indonesian Air Force Academy – "A.A.U." (Akademi Angkatan Udara abbreviated AAU), located in Yogyakarta, is under the supervision of the Chief of Staff of the Indonesian Air Force. The academy has three majorings which are: electronics, engineering, and administration. Following graduation, students who are selected as Pilot and Navigator conduct further training in the Pilot and Navigator Flight School prior bearing the Pilot/Navigator designation. Active since 1945, but also inherits the traditions of former Dutch military aviation schools. Taruna refers to cadets in the Military Academy, Kadet refers to cadets in the Naval Academy, and Karbol refers to cadets in the Air Force Academy, respectively. Until 1999, before the Indonesian National Police officially separated from the armed forces, the Indonesian Police Academy ("AKPOL") also stood under the National Armed Forces Academy but now has separated from the Military and is under the auspices of the President of Indonesia controlled by the National Police Headquarters (Mabes Polri), where in the other hand the Armed Forces (Army, Naval, and Air Force) Academies of Indonesia is under the auspices of the Ministry of Defense controlled by the Armed Forces General HQ (Mabes TNI). Presently, the Police Academy is located in Semarang (Central Java), and is supervised under the supervision of the Chief of Indonesian National Police (Kapolri). All 3 academies and the Police Academy have a joint 4th class cadet training program since 2008, after completing it the cadets go to their respective academies to continue with the 3 remaining years of study before commissioning. Imam Ali Officers' University (Persian: دانشگاه افسری امام علی; acronym: دا اف, DĀʿAF), formerly known as Officers' School (Persian: دانشکده افسری) is the military academy of Ground Forces of Islamic Republic of Iran Army, located in Tehran, Iran. Cadets of the academy achieve the second Lieutenant rank upon graduation and join one of Islamic Republic of Iran Army branches. 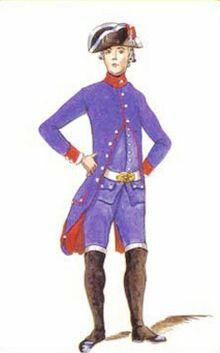 A cadet of Italy's Nunziatella military academy in 1787, the year the academy was established. Nunziatellais is the oldest military academy in the world still operating without interruption. The 2009–2010 school year has been the first one with girls attending those schools. Cadets of the Military Institute of the Kazakh Ground Forces march in the 2015 Moscow Victory Day Parade. Cadets of the Korean Military Academy during a visit to United Nations Command. 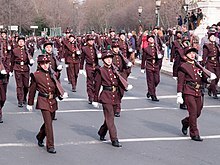 Cadets of the Military Institute during a parade. 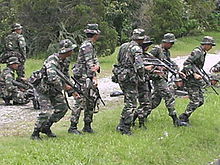 Cadets of National Defence University of Malaysia on an exercise. The institution is a post-secondary school operated by the Malaysian Armed Forces. Reserve Officer Training Units (Malay: Pasukan Latihan Pegawai Simpanan or PALAPES) or ROTU exists only in public universities in Malaysia. This is a tertiary institution based officer commissioning program to equip students as officer cadets with military knowledge and understanding for service as Commissioned Officers in the reserve components of the various branches of the Malaysian Armed Forces. 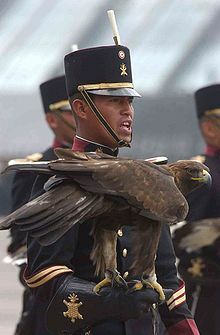 A cadet of Mexico's Heroic Military Academy with a golden eagle, the institution's mascot. Cadets in a classroom of the Netherlands' Royal Naval Institute. The academy is a part of Nederlandse Defensie Academie. 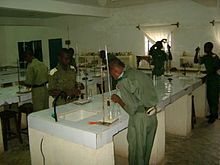 Cadets in a lab of Nigeria's Air Force Military School, a boys-only military high school. Air Force Girls Military School, Jos – Nigerian Air Force military school for girls. Armed Forces Command and Staff College, Jaji, at Jaji, Kaduna – joint Nigerian Armed Forces higher studies institute for both indigenous and international students. National Defence College, Abuja, – school for training senior officers of the Nigerian Armed Forces and also some members of the civil service. Buildings of the Norwegian Naval Academy, an undergraduate institution intended to instruct officers of the Royal Norwegian Navy. A passing out parade at Pakistan Military Academy. The Francisco López Military Academy is located in Capiatá, Paraguay. Graduating cadets of Philippine Military Academy at a homecoming. The National Defense College of the Philippines is a graduate-level military college established in 1963. The Philippines patterned all its military academies after the United States Military Academy (WEST POINT) and the United States Merchant Marine Academy. Philippine Military Academy, City of Baguio – It is a primary training school for regular commissioning as officers of the Philippine Army, Philippine Navy, Philippine Marine Corps and the Philippine Air Force, and it is under the control of the Department of National Defense. It was formerly named as the Philippine Constabulary School but was renamed before the 1930s. during the American era, U.S. Army Cavalry Officers established the school for the professionalization of the defunct Philippine Constabulary enlisted personnel. In 1992, PMA stopped producing constabulary cadets after the creation of the Republic Act 6975 which as a result the Philippine Constabulary and the Integrated National Police were officially merged and renamed as The Philippine National Police. Beginning in 1993 this has become a co-educational military academy. Philippine Merchant Marine Academy, Zambales – It is a school for midshipmen who shall serve in different private shipping companies, foreign or local. Its midshipmen may serve in the Philippine Coast Guard and the Philippine Navy as an ensign after graduation depending upon their choice. All PMMA midshipmen are also automatically appointed by the president of the Philippines as ensigns or 2nd lieutenants in the Philippine Navy Reserve. This is the oldest of the Philippine service academies having been established in 1820 during the long period of Spanish rule in the country, and was first situated in Manila for so many years. Philippine National Police Academy, Cavite – during the 1980s, it served as a school for selected enlisted personnel and civilians to join as a Police/Fire Lieutenants in the defunct Integrated National Police. After the merging of the Philippine Constabulary and INP in January 1, 1991 it became the primary officers school for the new Philippine National Police, the Bureau of Fire Protection and the Bureau of Jail Management and Penology, all under the Department of the Interior and Local Government. The Philippine National Police Academy graduates are automatically appointed as Inspectors/Lieutenants in the Philippine National Police, Bureau of Fire Protection, and the Bureau of Jail Management and Penology according to their choice of public safety curriculum during their cadetship. This is under the supervision of the DILG and the Philippine Public Safety College. Aside from the PMA and the PMMA, all three branches of the AFP have their own Officer Candidate Course Programs for both men and women, patterned after their US counterparts. 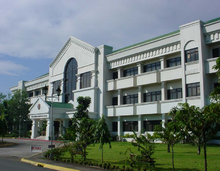 National Defense College of the Philippines, Quezon City – is a school for senior AFP officers for military/naval planning and to ready them in holding the ranks of Brigadier General/Commodore. Notable civilians may enroll and be given the honorary rank of Lieutenant Colonel/Commander in the AFP Reserve upon graduation. Cadets of the Polish Naval Academy aboard the ORP Iskra, 1937. Students of Colégio Militar on parade. The school is one of two pre-university institutions in Portugal. Instituto dos Pupilos do Exército, Lisbon – vocational education military school. The Bemposta Palace of the Portuguese Military Academy, an undergraduate-level institution. Instituto de Estudos Superiores Militares, Lisbon – Joint command and staff college. Escola Superior Politécnica do Exército, Amadora – Undergraduate school for training NCOs to become officers. Escola do Serviço de Saúde Militar, Lisbon – Portuguese Armed Forces nurse and paramedic undergraduate school. Instituto de Altos Estudos da Força Aérea, Sintra – Air Force graduate and staff college. The Cadet Corps is an admissions-based military middle school for young boys that was founded in the Russian Empire in the year 1732, soon becoming widespread throughout the country. Moscow Cadet Corps "Heroes of the Battle of Stalingrad"
A cadet of Moscow Suvorov Military School. The high school was the first of several Suvorov Military School established throughout Russia. Suvorov Military School are a type of boarding school in modern Russia for boys of 14-18. Education in such these schools focuses on military related subjects. Nakhimov Naval School is a form of higher military education for teenagers introduced in modern Russia. 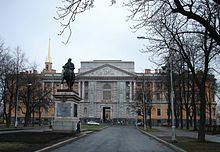 The Engineers Castle of Russia's Military Engineering-Technical University, with a monument to Peter the Great in the foreground. Established in 1832, the Military Academy of the General Staff of the Armed Forces of Russia is a post-graduate military academy. 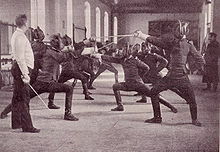 Photo of cadets fencing at the Serbian Military Academy. South African Military Academy offers a three-year BMil degree to officers in the SANDF. The General Sir John Kotelawala Defense University, was established in 1980 and is named after Gen. Sri John Kotelawala the 2nd Prime Minister of Sri Lanka. Taking cadets from all three armed services, 3 non-university level Military Academies, one for each armed service providing basic training for officer and a Command and Staff College for senior officers of the three armed services. Karlberg Palace, home of Sweden's Military Academy Karlberg. Established in 1792, it is the oldest military academy in the world to remain in its original location. Cadets of the Turkish Military Academy at 2016 Sandhurst Competition at West Point. Cadets of the Military Institute. Bihanga Military Training School – Located at Bihanga, in Ibanda District, Western Uganda. A parade at Welbeck Defence Sixth Form College. The College is one of two pre-university level institutions in the country. Welbeck Defence Sixth Form College – Sixth form college for 16- to 18-year-olds providing A-Level education in preparation for entry into the British Armed Forces or Ministry of Defence Civil Service as Technical Officers, following undergraduate education sponsored under the Defence Technical Undergraduate Scheme (DTUS). Duke of York's Royal Military School – Military based secondary school in Dover, Kent; students are influenced to join the forces after education, but have no commitment to do so. There are also numerous Cadet forces that operate for all branches of the armed forces for children aged 10–20. These are not designed to recruit people into the armed forces but rather are simply Ministry of Defence sponsored youth organisations. Although an undergraduate degree is not a pre-requisite for Officer training, the majority of potential Officers will have attended University before joining the Armed Forces. At some universities there may be the option for people to join either a University Royal Naval Unit, a University Officer Training Corps (UOTC) or a University Air Squadron; which are designed to introduce students to life in the Forces and show them the careers that are available. People sponsored under the Defence Technical Undergraduate Scheme will join one of the four Support Units attached to universities participating in DTUS. There is a requirement for bursars of DTUS to join the military for 3 years after completion of their degree, there no requirement for students of any other organisation to join the military after they finish their degree programs; and the great majority have no further contact with the armed forces. Although service with these organisations may give some initial benefit to cadets attending the military colleges/academies, the next stage of the officer training programs assumes no prior military experience/knowledge, and those that did not partake in military activities at university are not disadvantaged. 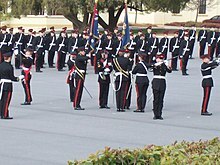 The Passing Out Parade at Royal Military Academy Sandhurst. Sandhurst is one of four military academies in the United Kingdom. There are now four military academies in the United Kingdom. Although the curriculum at each varies due to the differing nature of the service a man or woman is joining, it is a combination of military and academic study that is designed to turn young civilians into comprehensively trained military officers. Officer Training for the Reserve Forces (e.g. 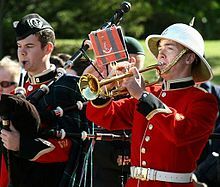 Army Reserve, Royal Naval Reserve, RAF Reserves & Royal Marine Reserves) also takes place at the relevant military academies, but under a different curriculum and the courses tend to be concentrated into a much shorter period. The first RAF Staff College course at Andover, 1922. The staff college operated from 1922 to 1970. In the United States, the term "military academy" does not necessarily mean a government-owned institution run by the armed forces to train its own officers. It may also mean a middle school, high school, or college, whether public or private, which instructs its students in military-style education, discipline and tradition. Students at such civilian institutions can earn a commission in the U.S. military through the successful completion of a Senior Reserve Officers' Training Corps program along with their college or university's academic coursework. The term military school primarily refers to pre-collegiate secondary-school-level military institutions, which were more common before the 1970s and 1980s. The term military academy commonly refers to a pre-collegiate, collegiate, and post-collegiate institution, especially the U.S. military-run academies. The term US military staff colleges refers to separate graduate schools catering to officers on active duty. Most state-level military academies maintain both a civilian student body and a traditional corps of cadets. The only exception is the Virginia Military Institute, which remains all-military. Cadets of the United States Military Academy (USMA) navigate the horizontal ladder and vertical rope obstacle of the Indoor Obstacle Course Test. USMA is one of five federal service academies. Although Texas A&M University has transformed into a state university, it still maintains a corps of cadets along with a civilian student body. 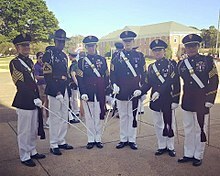 Cadets of Marion Military Institute after the Alumni Weekend parade. The Institute is one of four junior military colleges in the United States. University of North Georgia, Dahlonega, Georgia — Formed by a 2013 merger with Gainesville State College, its main predecessor institution, last known as North Georgia College & State University, was chartered as a military college. However, when NGCSU was founded in 1873 as North Georgia Agricultural College, it had both a corps and a civilian student body, and was also the state's first coeducational college. Norwich University Corps of Cadets. Norwich University, Northfield, Vermont is a private university located in Northfield, Vermont. It is the oldest private military college in the United States. The university was founded in 1819 at Norwich, Vermont, as the American Literary, Scientific and Military Academy. It is the oldest of six senior military colleges, and is recognized by the United States Department of Defense as the "Birthplace of ROTC"
Along with VMI, these institutions are known as the Senior Military Colleges of the US. Cadets of the Great Lakes Maritime Academy learning how to row a boat. The institution is one of six military-styled maritime academies in the United States. These merchant marine academies operate on a military college system. Part of the training that the cadets receive is naval and military in nature. Cadets may apply for Naval Reserve commissions upon obtaining their Merchant Marine Officer's licenses. Most if not all also offer some form of military commissioning program into the active duty US Navy, US Marine Corps, or US Coast Guard. A classroom at the School of Advanced Military Studies, one of four staff colleges of the United States Army. The National War College, a school of the National Defense University is a multi-service staff college in the United States. The Tashkent Higher Tank Command School during the soviet period. ^ "Royal Danish Naval Academy". Royal Danish Defence College (in Danish). Retrieved 7 January 2016. ^ "Woolwich History". Archived from the original on 2013-08-06. ^ Richard A Harmon. "Perspectives in the History of Military Education and Professionalism" (PDF). ^ Linton Hall Cadet, Linton Hall Military School Memories: One cadet's memoir, Arlington, Virginia. : Scrounge Press, 2014 ISBN 978-1-4959-3196-3 describes a military school for boys ages 6-16. ^ "National Defence College". www.ndc.gov.bd. ^ "Ejército de Bolivia". www.ejercito.mil.bo. Archived from the original on 2008-11-05. Retrieved 2009-08-13. ^ DCOM. "Choix de 4A des promotions précédentes - Orientation 4A". portail.polytechnique.edu. ^ "საქართველოს თავდაცვის სამინისტრო". eta.mod.gov.ge. ^ "Rashtriya Military School". www.rashtriyamilitaryschools.in. ^ "Akademi Militer – Center Of Excellence". www.akmil.ac.id. ^ "اسم هاي مخفف در نيروهاي مسلح". www.parsine.com (in Persian). Retrieved 2016-09-11. ^ "Portal Rasmi Universiti Pertahanan Nasional Malaysia". www.upnm.edu.my. ^ "1000 TFG Somali soldiers passed out at Bihanga military training". ^ "Museveni shakes up top army command". ^ "Факультет підготовки офіцерів запасу Національний університет оборони України Київський (військова кафедра)". www.nudu.io.ua. ^ "History of Academy". Army Academy named after hetman Petro Sahaydachyi. Archived from the original on 3 November 2013. Retrieved 3 July 2013. Cadet, Linton Hall, Linton Hall Military School Memories: One Cadet's Memoir, Scrounge Press, 2014. ISBN 9781495931963. Memoir of cadet who attended a military school for boys ages 6 to 16. Wikimedia Commons has media related to Military academies. Memories and discussion of military school for elementary and junior high school boys. Another site with memories and discussion of the same school.